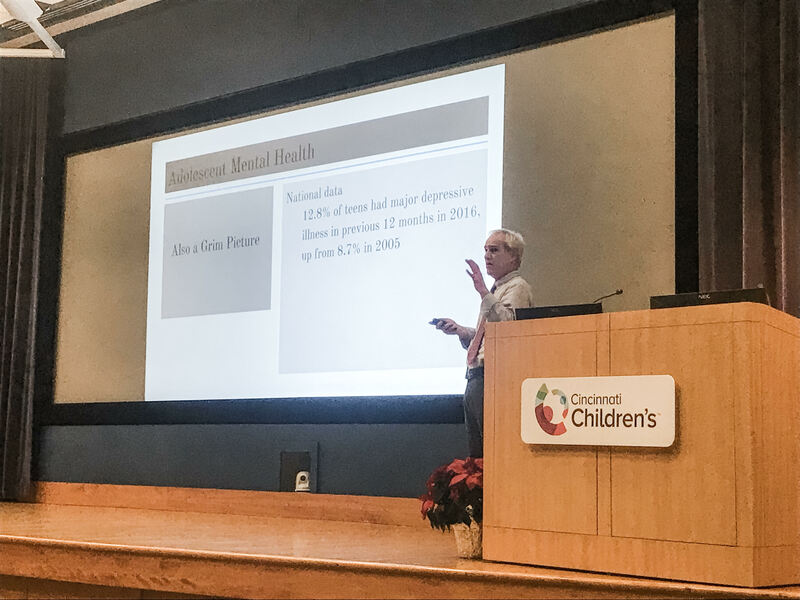 Because of our partnership with MindPeace and Cincinnati Children’s Hospital, we were able to provide our community with a free educational presentation from Dr. Slavin, MD, MEd on “Stress and Distress in Our Kids: What Can We Do?” Dr. Slavin discussed the current academic system and how it is negatively impacting the mental wellness of our youth. Dr. Slavin then outlined how he was able to create change while Dean of Curriculum at St. Louis University Medical School for the medical students resulting in incredibly lower instances of students experiencing episodes of major depressive disorder and anxiety all while IMPROVING performance for St. Louis medical students on the National Board Examination taken by all year-two medical students. Dr. Slavin detailed how the university achieved this with a very small budget ($3,000/year) and by reducing academic coursework, providing positive skills training in dealing with stress and difficult situations, and providing students an opportunity to give back to their communities. As Dr. Slavin demonstrated and discussed, educational change does not require more from educators or institutions, but rather a look at what academic work is truly necessary and where we can reduce excess so that students are able to have more time to sleep or recharge, engage in purpose-filled activities, and practice positive coping skills during times of high stress.